Yay! I have a podcast thanks to the interview I did while at the Pulmonary Hypertension International Conference in June of 2016 and to Steve Van Wormer’s awesome PHAware Global Podcasts. He helps bring awareness to Pulmonary Hypertension. He gives those of us who have the various forms of PH an opportunity to share our stories of what it’s like to go through the process of becoming diagnosed and then living with this incurable disease. My podcast by PHAware.global to help spread awareness of Pulmonary Hypertension. Please support this effort by going to this website: “Donate now to support pulmonary hypertension research. Engage for a cure with phaware.” You could even get an “I’m Aware That I’m Rare” t-shirt to spread awareness when you donate. I highly encourage you to check it out. After you listen to my podcast, come back to my blog and click on the tab above, “Pulmonary Hypertension,” and scroll down to the section that says “My PH Story.” This is something that I wrote that includes everything I wanted to say additionally to what I said in the podcast. I’ve been waiting for this conference to come for the past several years. It was held several years ago in Canada and ever since then, I’ve been really, REALLY wanting to good. Seriously though, this conference is hugely important because it’s where PH patients (like me), Caretakers (like K), PH physicians and some sponsors all come together to offer the latest information about Pulmonary Hypertension. There will be support groups for parents of children with PH as well as for adults with PH and even for the caretakers. I’m super excited to be spending the weekend there. I’ll have my puppy with me in my room. I think it will be a wonderful experience to be surrounded by so many wonderful people and learning how they have adapted their lives to overcome the challenges of having Pulmonary Hypertension. I’m really interested in finding the people who were born with scoliosis and have PH as well. That’s similar to my health condition. I was born with Pulmonary Hypertension. So that makes me a long-term survivor of secondary PH and hopefully I can offer information to anyone who asks me. I will be blogging my experience while at the conference. Hopefully I will have lots of pictures to post & show you. I’m still thinking of whether or not to take Klondike, my rubber chicken. He’s going to need a new hat. My sister kept Klondike’s beach hat. Probably for the llama she has. haha! Be sure you FOLLOW my BLOG to read all about my fun adventures and living on O2 for life! A good read… trust me..
You know I love writing on my blog about living on oxygen and all that it entails but when an opportunity comes along where I share more of what I know to the world, of course I’d jump at it. I was approached by another blogger, Johan, who writes an incredibly wonderful blog. It’s not about his life. He took blogging to a whole other level. Have you ever been curious about things? Johan interviews people who have incredible stories to tell about all sorts of subjects. Sad stories, adventure, war, inspirational people, space travel… just a lot of interesting interview articles. When I first visited Read an Interview and started reading the interviews, I thought…these are good! They are something that easily could be in a magazine. So, Johan, emailed me a list of questions pertaining to living with Pulmonary Hypertension and the equipment that I use to survive this incurable disease. I dug deep with this one. It’s the first time I’ve ever done an interview and I hope you like it. 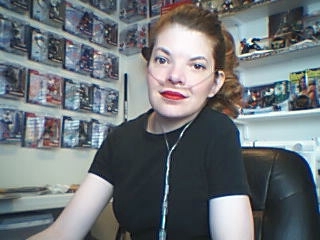 If you would like to read it, you can find it here: Living with Pulmonary Hypertension. I really miss Photoshop. Seriously, I do. I really love taking pictures and also creating neat-looking graphics. So, I fell in love with Photoshop when I had a PC computer. Now that I have a MAC, I don’t have Photoshop. I looked for an app to create something to bring awareness to this month’s Pulmonary Hypertension Awareness campaign. You know, something subtle but eye-catching. Naturally, my picture was in my creation. hehe! Look to your left. Stunning, isn’t it? Ok, don’t laugh. I could only find a very basic app to put text on my photo. So sad. But! It gets the message out there and that is what’s most important. For those who need more information on Pulmonary Hypertension please go to: Pulmonary Hypertension Association. We need YOU to spread the AWARENESS of Pulmonary Hypertension! Hello to November! It’s finally cool weather. I never thought this day would come here in Texas. There is something else exciting happening in November! Oh yes… exciting, indeed! November is the month designated for Pulmonary Hypertension Awareness. So, get out your Periwinkle or Purple clothes and support PH for the cure! Seriously, we need your help. Did you know that Pulmonary Hypertension is a incurable disease… that means, there’s no cure.. YET! With YOUR help, by spreading the awareness of this disease, you can, not only help others to become educated about Pulmonary Hypertension, you can be saving someone’s life. Did you know that Pulmonary Hypertension is often misdiagnosed? For example, a lot of people with PH, before being diagnosed, just think that they are out of shape or their doctors think they have asthma or just extra tired. PH is a serious disease that can kill within 3 years of being diagnosed without medical treatment. I don’t mean to scare people. I mean I have this disease. There are only 12 approved medications to treat Pulmonary Hypertension. That’s not nearly enough. Double lung transplants can cure you but how many people out there have signed up to be a donor? Are you one? If you are and I could be approved to have a transplant (which I can not), I would thank you from the bottom of my heart. There are several ways to read up on Pulmonary Hypertension. You can visit Pulmonary Hypertension Association or visit PHAware. I want to add a SHOUT OUT for two websites that sell some pretty awesome PH jewelry. PHantistic Jewelry and Josephine’s Jewelry. I’ve bought from both of these lovely ladies and they make some awesome jewelry for a price you can’t beat! Support Pulmonary Hypertension Awareness and wear that periwinkle or purple!! !